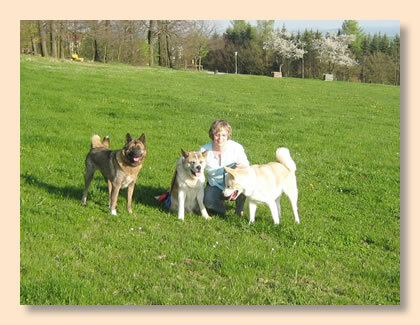 Our three Akitas enjoy our long walking tours through the hilly landscape of Ohorn in spring. Cheyenne and Jane are best friends again. Our H-litter is history now and all puppies have moved to their new families. Now it's their families' turn to write stories about their Akitas that we can present on this website. Once again we want to say thank you to all the people who took interest in how our puppies have matured and wrote entries and comments on this website.